LAMusArt’s Playmaking project approached their goals with a lot of ambition and spirit. Their program was an exciting one, aimed at engaging students ages 9 – 11 in the fundamentals of playwriting over the course of 10 weeks, culminating in a full scale performance of the student written plays by adult actors. It can be extremely difficult to schedule several adult actors to appear in one place at any one time, but in Los Angeles this difficulty can be compounded. So the fact that they were able to get 11 kids plays up and running cast with professional actors is something that on it’s own should be applauded. But before we get into what they accomplished, let’s take a dive into what goals they set out to accomplish. 1) to give underserved students in their East Los Angeles communities a public opportunity to experience success and recognition through artistic expression, authorship, and performance regardless of race or gender. 2) to aid the growth and development of each student’s important life skills, including their cognitive and emotional evolution, and their creative, academic, social, and behavioral progress by way of artistic opportunities. 3) to validate each student’s unique voice by giving them an opportunity to tell and see their own stories about their respective experiences. 4) to bridge the gap between our community and the life-affirming power of the arts, which they’ve been traditionally barred from due to barriers like language, finances, and exposure. 5) to provide students with the academic attention they lack in public schools, including inclusive and enriching creative programs and better student/adult ratios. 4) to increase student learning in fundamental theater concepts and practices. Now, a number of these goals seem a bit hard to quantify. Many of which won’t be fully known until long after the student has left the program. But, you might be surprised by the results that the parents are reporting. But we’ll get to that shortly. So how did they accomplish their goals? Over the course of 10 weeks, each student kept a notebook of their weekly writing exercises, vocabulary lessons, and understanding of key concepts. Each student was able to grasp these exercises, as proven by the completion of their original plays. Although some plays were more complex than others, every student completed a play with at least two characters and a central conflict between those characters. The driving idea that was used to emphasize dramatic storytelling was “Want. Conflict. Change.” They started the course by establishing that every character must have a strong want or wish. To move the story forward, they put characters with different wants in a scene together to establish a high-stakes conflict, in which the characters want to get in the way of each other. To resolve the story, they needed a change, from either one or both characters, or an outside force. The idea of “Want. Conflict. Change.” was interpreted in different ways by each student, resulting in wildly different, but entirely vibrant and entertaining works. And having personally attended the event I can say that what resulted was a wildly surreal night of shows. Even though their concepts were simple… or often nonsensical (like the boy and his friend, and a slice of pizza) what they demonstrated was unfiltered creativity. It’s not often that playwrights get to write without self consciousness, and while it’s doubtful that they approached it without self doubt — the final product betrayed a sense of fun, unfettered imagination, and clear encouragement to tell the story they want to tell. So where are the students now and how are they doing? According to reports from the parents, the students have seen vast improvement in all areas that the program set out to address. 100% said their collaboration and creativity skills developed over the 10 week course. Now, I’m no math teacher, but 100% returns across the board seems to me to be pretty good results. If not pretty great. But no program is without its challenges. How can this one improve? The most notable challenge was the coordination of rehearsal time for all eleven groups of adult actors and directors. It was difficult to fit adequate rehearsal time for all eleven plays into a two week period, causing them to schedule additional rehearsals with actors and a prolonged tech period in the theater space. Another challenge they faced was giving the composer sufficient time to compose an original song for each play. Because the songs and plays were not written until Play Day, the composer was unable to read the plays and lyrics until a day before the first rehearsal, giving barely enough time to compose a new piece. They believe this can be improved by having the composer present on Play Day to aid the students in writing their lyrics. This will also give the composer a better idea of what the student has in mind stylistically for their song. Completely surmountable challenges aside, this program seems to have legs that are going to carry it into the future and help improve the confidence, writing, and collaboration skills for any students involved. This entry was posted in Academic Enrichment, Arts Education, Literacy & Writing Skills and tagged actors performing student work, dramatic writing, Playwriting. Back in May we introduced you to an innovative and exciting project being spearheaded by Scott Storm and the educators at Harvest Collegiate High School called Teaching for Social Justice. While it’s only been a few months since the original blog post, “Teaching for Social Justice transforms curriculum, educator mindset and improves student learning” (May 2016), it’s been two years since the McCarthy Dressman Education Foundation funded this project. We are exciting to be brining you another update on this effort to improve effectiveness and equity in high school classrooms. Before we can talk about what they are doing now, let’s revisit the project’s original goals. “Teaching for Social Justice” aims to design curriculum, support the development of teachers as social justice educators, and disseminate these lessons to progressively wider audiences. This requires a break from a dominant paradigm which views teaching as monologic, teacher-centered, and lecture-based. The following goals have been explored in this project. Design and revise courses to better support teaching for social justice. Conduct cycles of teacher inquiry and action research to further teaching and learning. Develop and grow a Professional Learning Community in our school that shares curricular materials, participates in peer-observation, and supports each other in formal and informal ways toward the goal of teaching for social justice. Disseminate our curriculum and research to teachers, teacher-educators, and the public. What kind of teacher development efforts strengthen social justice pedagogy? In the past two years they have made a lot of progress on the following four goals. We’ve shared them below with some examples of student work in this teacher development project. Curriculum Retreats: In the first year of the project they held Curriculum Retreats to promote ideas for new courses, start to draft the courses, and reflect on their past work. o Winters 2015 and 2016, New Course: “Writer’s Retreat”: They created a new course for the January term (two weeks) called “Writer’s Retreat” in which 26 students traveled to a cabin (with no Internet, television or other electronic distractions) for several days. Many of the students came out of this experience with stronger writing skills. o Fall 2015, New English Course—“Human Nature”: In this class students read Locke, Hobbs, & Rousseau alongside Lord of the Flies and Macbeth. 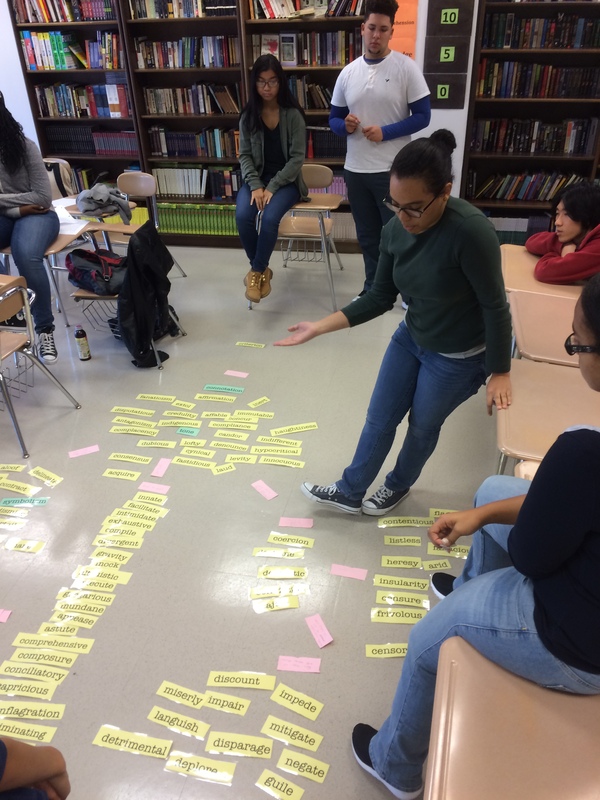 Students explored ethical and moral issues and participated in group simulations and role-playing activities that identified ethics, oppression, and privilege. o Spring 2016, New English Course—“Dysfunctional Love”: This course engaged students in questions around love and relationships through some classic literature. 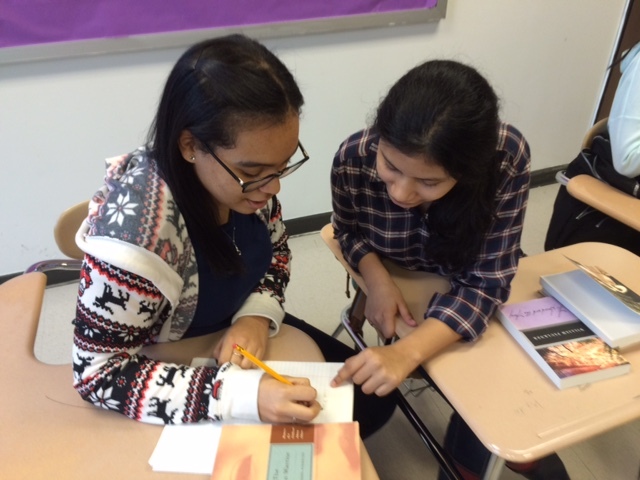 Students read Romeo and Juliet, Jane Eyre, Their Eyes Were Watching God, and other texts. Students talked through difficult issues while also analyzing textual form. o 2015-2016 School Year, New Course—“AP English Literature & Composition”: This past year they offered an AP English Course open to all students. They recruited from special education classes, English Language Learners, low-income students, and those who are normally not encouraged to take AP at other schools. Students read poetry and many works including: Pride & Prejudice, The Sound and The Fury, Mrs. Dalloway, Invisible Man, Waiting for Godot, The Woman Warrior, Beloved, Midnight’s Children, Angels in America, and The Brief Wondrous Life of Oscar Wao. Some essential questions that guided these courses were “what is literature—and what do we do with it?” and “what is the relationship between form and meaning?” The assessment at the end of the unit asked students to use the theories of literary modernism to create their own short stories, poems, paintings, or musical scores, and then present and/or perform these at an evening coffee-house event. Goal 2: Conduct cycles of teacher inquiry and action research to further teaching and learning. Teacher Research Team: For the past two years, Teacher Research Teams conducted inquiry on their teaching. They developed essential questions, created research designs, discussed relevant scholarship/literature, collected data, and analyzed the data together using qualitative research. English Department as Teacher Inquiry Team: Teachers focused on two areas: reading literary texts and writing as process. For each of these inquiries, they read articles about pedagogy around close reading, conducted their own close readings together, analyzed student work, planned for implementing shared practices, implemented these practices, analyzed post-intervention data, and created a plan for future directions. Classroom Ethnography Project: Teachers in the teacher research team served as ethnographic participant observers in each other’s classes (one or two periods a day). The dialogue between the teacher and the researcher improved both teaching and student learning. The Teacher Summit: A “Teacher Summit” was a day-long conference where half of the faculty presented on the courses they developed, on a portfolio of their work, or on one of their teacher inquiry projects. The faculty were excited for continued improvement of their teaching and the enhancement of their professional community. o Year One: In the first year of the project they brought together three teacher teams focused on: 1) descriptive review of student work in order to reflect on and refine teaching practices; 2) designing and implementing intervention plans for high-need students. ; and 3) use of Critical Friends Group protocols from the National School Reform Faculty to fine-tune curriculum and assessment. Year one was about deep understanding and new knowledge. o Year Two: In the second year of the project, they had the teachers from each of these teams use the skills that they had learned the first year to spread this learning so that all teachers became more familiar with these methods. o Teacher Study Group: Each semester the Teacher Study Group chose a focus of study. In the fall, the group looked at “questioning as pedagogical tool” and in the spring they explored “formative assessment.” Each week they read a peer-reviewed journal article about the topic and discussed how this could improve their practice. o Whole-Faculty Peer-Observations: In year one they had all teachers conduct a series of monthly peer-observations. They continued this practice in year two which has been helpful for the teachers to see themselves as a community of practitioners rather than individual silos. There has been substantial progress in this area. They have written conference proposals, presented at conferences, and had articles published about their work! Publication: Storm, S. (2016). “Teacher-Researcher-Leaders: Intellectuals for Social Justice” Schools: Studies in Education. 13.1 57-75.
o February 2015, “Tensions in the Teaching for Social Justice” presented at the University of Pennsylvania’s Ethnography in Education Forum. o December 2015, “Epistemological Tensions in Teaching for Social Justice: A Case Study” presented at the Literacy Research Association’s annual conference in Carlsbad, CA. o February 2016, “Reading Literary Criticism: Method of Critical Liberation or Tool of Cultural Assimilation?” presented at the University of Pennsylvania’s Ethnography in Education Forum. o Spring 2015, NYC Writing Project Teacher to Teacher Conference—one of our colleagues presented her work at this conference. Additionally, they have submitted a number of presentations that are currently under review. How does social justice pedagogy impact teachers and students? They have definitely been busy and while it is great to hear what they have accomplished, it is even more important to hear about how they are doing. We also wanted to know how the teachers responded and how this has impacted students. This project allowed teachers to collaborate, build shared professional knowledge, and to work toward social justice. In the first year of the project they did a lot of capacity-building as they worked to develop the skills of teacher-researchers. This year they have gotten to reap the benefits of putting so much time and energy into these activities. The English department in particular had some major achievements. They continue to create new courses that leverage students’ strengths and engage them in rigorous intellectual instruction. This has been a benefit to both teachers and their students. Finally, a big achievement this year has been having some of the teachers going to and presenting at conferences. At the conferences they shared their work with a wider audience. By doing this, they are hoping to improve practice beyond their school. 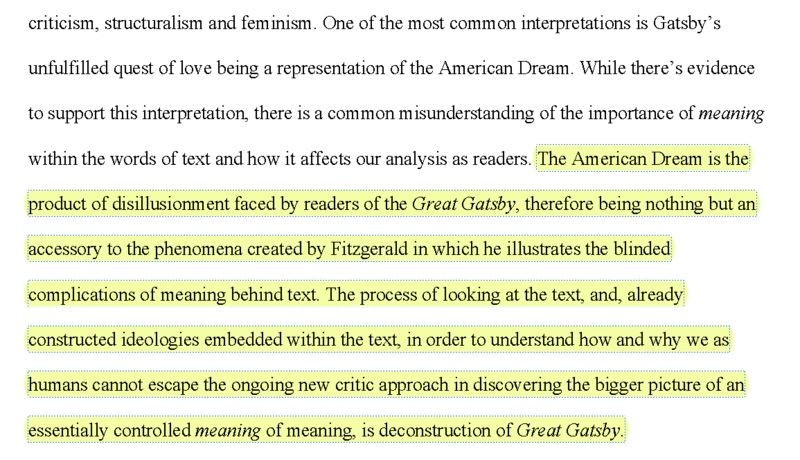 Excerpt from Harvest Collegiate Student, Karen S.’s paper from the Lit, Crit & Grit: Deconstruction course. As exciting as this project is, it’s not without it’s challenges and ways to improve. While many of the challenges from year one were about creating buy in and building capacity, the challenges the second year have been about sustainability. The teachers have found themselves with less time budgeted for professional development meetings than they would like but they are working around it as best they can. Additionally, it has been difficult to get teachers to write about their experiences for wider audiences. To address these for next year, they are scheduling more time to write, reflect and think about how they can frame their learning for wider audiences. They have also started to have more teachers present at conferences to “get their feet wet” in conversations beyond their school. Challenges aside, it sounds like this program is reaping benefits that ripple far beyond teacher development. Students who were never given this opportunity are excelling and teachers are learning to better serve those students. The pursuit of Social Justice is an invaluable virtue but this program goes to show it can also be a valuable teaching tool. Where can I learn more about implementing a social justice curriculum? This entry was posted in Literacy & Writing Skills, Social Studies, Student Engagement, Teacher Development and tagged curriculum, social justice pedagogy, teacher development. Connecting lessons learned in classrooms to real world applications is one of the great challenges in teaching. Teachers and administrators at Harrison High School in Evansville, Indiana have come up with an innovative new classroom model to address that challenge. They have created the Center for Family and Community Outreach (CFCO), which aims to use student skills (built around academic content) to create documents, multimedia, events, presentations, and more for over twenty non-profit organizations in their community. Educators are able to connect students with members of the non-profit community, creating a symbiotic relationship wherein the student gains valuable real-life skills and the non-profits get a free service. Not only is it easier to engage teenage minds directly if they feel a sense of involvement and contribution towards the betterment of their community, it also helps teens build invaluable skills for the transition into their adult lives. How can service learning support non-profits and drive engagement for learners? Students enrolled in the program also volunteered at the Evansville Rescue Mission to fill Thanksgiving Food Baskets. but is truly innovative for the level of engagement it produces for students. Students are engaged, build real world skills and earn credit. This program has seven distinct goals. Research the non-profit groups and social issues in students’ communities. Hold ‘Round Table’ discussions with local experts on special topic issues using the latest online literature and information. Tour the non-profit facilities and volunteer with local organizations and events. Openly communicate with the community through blogging and video reflections. Students are immersed in the tangible application of skills from the classroom, and since students know what they are doing will have a real impact on their community, it is readily apparent how seriously they take it. The program has relied on a tremendous amount of community support and is currently in it’s third year of operation. Fortunately they continue to draw in new non-profit partners based on the satisfaction of their initial partners and publicity the projects have generated for the mission of non-profits in Evansville. Students have a sense of ownership and engagement in their work as well as their community. Non-profit data shows that the community’s organizations have much higher perception of the schools and teens’ abilities after working with the CFCO. Moving forward they plan on moving the program to a half day model, to increase student exposure, as well as continuing to nurture community involvement and contribution. With such an easily adaptable model, educators around the country should be looking to Evansville, and Harrison High School in particular. How they proceed could very well dictate how dozens of similar programs pop up in the future. Community involvement and concrete links between lessons learned in the classroom and real world applications are key in both advancing education as well as building a student body that is invested in the present and future of their community. While the saying “It takes a village to raise a child,” has been politicized as of late, I think we can all agree that fostering a child’s investment and involvement in his or her village can only lead to positive results. This entry was posted in Academic Enrichment, Literacy & Writing Skills, Student Engagement, Technology and tagged CFCO, community, education, Project-based learning, service learning, Student-centred learning. As we wrote earlier this year, “Among the many challenges facing us in education one of our most formidable foes is the comprehension gap, across all content areas, between students of low socioeconomic status and those of high socioeconomic status.” The multi-year project Opening Classrooms to Close the Knowledge Gap‘s goal was to enhance students’ ability to develop literacy across the diverse content areas. In the first post, we shared how teachers at School for the Future in New York City had addressed students’ ability to work autonomously through Peer Assistance and Review seminars that took place after school. In this post, we’ll look at how the project worked to build a school wide culture of Teacher-Led Professional Learning Communities. 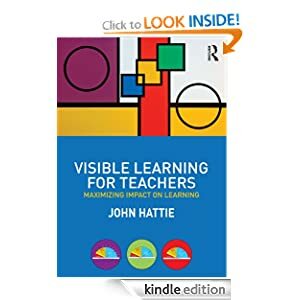 To support the goal of building this teacher-led culture, School for the Future teachers engaged in a professional study group around a shared text, John Hattie’s Visible Learning for Teachers. This book challenged their thinking and pushed the teachers into incorporating many of the exercises into their own coursework. A specific example from the book gave instructors a simple three-step process to analyze their own lessons by looking specifically at the learning intentions. What is the outcome I am tracking progress toward? How do I track progress toward that outcome? How do students track progress toward that outcome? In establishing the learning intentions the teachers looked at two things; skills necessary for participation in a democratic society and skills necessary for success in secondary and post secondary school. What did teachers choose to focus on? Persuasive writing. 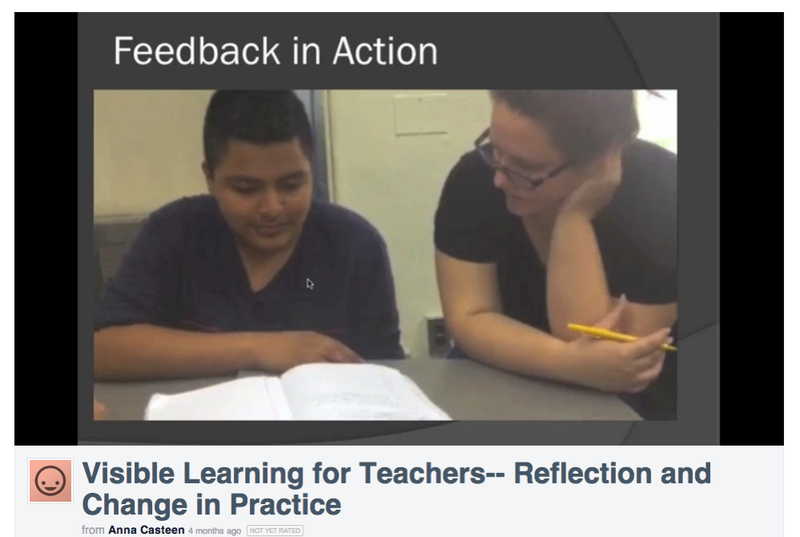 “We were intrigued by all of the different ways that we could offer feedback to our students,” shared Anna Casteen and HB Bruno (9th grade Inclusion Teacher and 9th grade Science Teacher) in their video presentation. 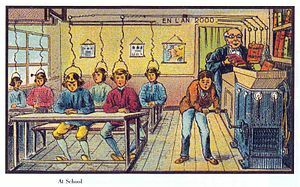 Although the teachers understood the need to zero in on writing performance, the students were somewhat harder to reach. To assist, teachers established another simple method of tracking student progress that included a common rubric that was used on every persuasive writing task and an online grading platform accessible to students, teachers, and parents. Every participant teacher constructed a video that encapsulated how participating in the study group enhanced their professional practice. During the first year, only 11th and 12th grade teachers participated while in the second year it was expanded to include 9th and 10th grade teachers. After the first year each of the participating instructors constructed a video encapsulating what they gained from participation and how the study group improved their professional practice. In this example, Scott Chesler, Inclusion Teacher, explains the impact of the teacher led professional development community. In the videos teachers spoke how the group led them to alter how they gave feedback to students, leading the students to get to know more about themselves as writers. Teachers noted in their annual report that they are attempting this change from the bottom up rather than the top down. For example, teachers like Stephanie Van Duinen (9th grade social studies) asked students for feedback about the course and then analyzed the information. When she learned that a signifigant group of students needed more feedback, she worked with her professional learning community members to form an action plan for providing “in the moment feedback” so that students could use the information to improve their work as soon as possible. This was a highly rewarding experience as it forced me to reexamine my beliefs about my own personal practice and think not so much about my methods of teaching but about their effectiveness. One teacher reported that the course helped him realize that student expectations have a high effect on performance so he reimagined his course to track individual student goals, regularly meeting with the students as he coached them forward. Jessica Candlin, 11th Grade English Teacher, presented how she used commenting features in Google Docs to support enhanced feedback for student writing in the slides below. Although there was a certain amount of trepidation when new teachers were introduced into the program during the second year, the collaboration ultimately led to powerful connections between educators. Teachers reported they could have started earlier in the year to complete the project. While it seemed like March would be an ideal start time, as most teachers have “settled” into their schedules, it made it difficult for them to get their video materials together in time for the deadline. In the future, the teacher led professional learning community will be able to draw on the important learning experiences from this project and continue making an impact on student literacy. Explore the following articles about teacher-led learning communities to learn more. This entry was posted in Literacy & Writing Skills, Teacher Development and tagged education, Google Docs, John Hattie, New York City, plc, professional learning communities, Professional learning community, School, Teacher, teacher led learning community, visible learning. Why does this matter in real life? Escalation: A Student Graphics Company is an After-School Program that draws a straight line between learning and career. One of the chief complaints you hear from students is “How can I actually apply what I’m learning to the real world?” And while there is no helping Algebra in that department, there are a myriad of other subjects that can benefit from a dose of real world interaction. This is what the Digital Art Afterschool Studio is doing. It’s taking a cue from larger real world curriculum programs, such as Career Oriented Curriculum and focusing on digital artistry and community involvement. What is Career Oriented Curriculum and how can it benefit students? Reality Check Experiences like this show the students the real life application for what they are learning. On the Job Experience Projects like the digital after school studio create professional connections that go beyond graduation and help move our students forward professionally. Students practice graphic design in a professional context – designing for real businesses. 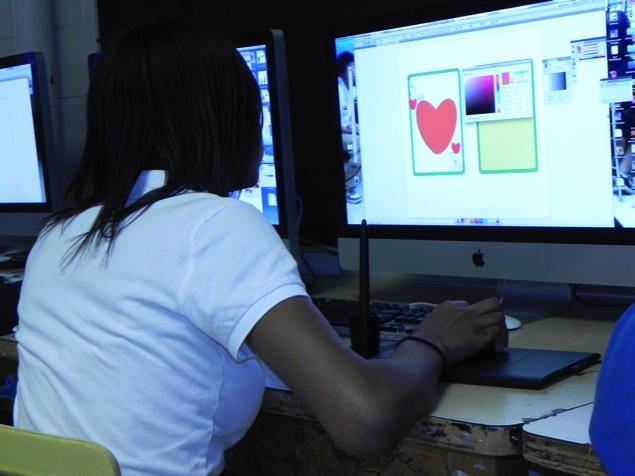 So how are the teachers and students at Overton High School, where the Digital Art Studio program has been in full swing for two years, applying the idea of career oriented curriculum to their specific needs? The program operates similar to a small graphic design studio. Taking place three times a week for two hours after school, students have the opportunity to really put work into a portfolio, and increase the possibility of scholarships and if a professional internship is tacked on, some AP credit. Projects are introduced from the needs of real world clients who the students and teachers reach out to. 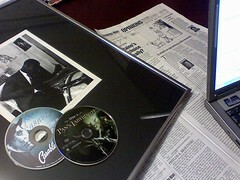 The projects can be anything from helping a local business create a print add to designing a website for a church event. This helps create crucial bridges between the school and the community around them, ultimately strengthening both. This program has had to start small, accommodating only a few students at first. The principal and instructors consult with local ad agencies to create an interview process for students to simulate a job interview. The students selected work together to create a marketing campaign to alert the community to their presence and start soliciting clients. It is their hope that this model will, after a couple years, become self-sustaining. What is the impact of a Career Oriented Curriculum? So where are the students that have already passed through this program? Here are just a few of the success stories. Olivia Campbell, a second year participant, was awarded a full scholarship to attend University of Tennessee’s summer program for her Digital Art exhibited in the West Tennessee Regional Art competition last winter. Darion Beasley, King Hobson, and Maurico Farmer (all second year participants) were selected as three of the thirty-three students chosen to be represented in the Frist’s Museum’s exhibition Tennessee’s Top Young Artists. This year’s West Tennessee Regional Art Competition just released their awards and participants currently in the program won Best Graphic Design work, Best Photographic work, and placed in several other categories. One of the program’s participants, Cesar Pita, was just offered a $66,000 scholarship, the Presidential Scholarship, from Maryland Institute College of Art in Baltimore, one of the finest art colleges. And these are just a few stories of success as this program continues to grow. It’s clear from the work that NAF does and how Overton High School applies it to their own program that career-oriented curriculum puts students at a huge advantage over their peers that do not participate. By giving students an education grounded in reality, rather than existing in the abstract on the white board, we strengthen their chances of succeeding in the real world. Forging professional connections early on only increases the chance of future employment and education. By also giving students a personal stake in how their work is perceived by the community at large we give them the opportunity to push themselves to create something they can be proud of. This entry was posted in After School Programs, Literacy & Writing Skills, Uncategorized and tagged arts education, authentic learning, Digital art, education, enrichment, Graphic design, literacy, National Academy Foundation, Overton High School, real-world, student publishing. So what is holistic writing and how can we apply it to our classrooms? Holistic writing is about mastering the art of looking at the big picture in its entirety before even putting pen to paper. It’s starting with the sum rather than the individual parts. Plot, characterization, grammar, cadence, all of these things are extremely important to learn individually; what’s more important is learning to use them in tandem. Even if every part is working fine on its own, if they don’t fit into the larger whole, the machine doesn’t work and the writing suffers for it. By changing how we approach teaching writing, we can impact how students comprehend material. So what can educators do to integrate holistic writing in the classroom? Learn and foster a new writing process: This can include cross-genre analysis of texts, incorporating new media into their writing assignments, and fostering a collaborative writing process. Require all students to write extensively: By writing frequently and for many purposes, learners can be comfortable writing extended prose in elementary school and onward, setting them up for success in college. Schools can aid this process by making sure they hire excellent writing teachers as well as creating a curricula that fosters writing across all content areas at every grade level. How can Holistic Writing be integrated in a Chicano Studies class? Teachers at Valley High School a public school, with a predominately Latino population, were awarded a McCarthey Dressman grant to develop a Holistic Approach to Writing. This school is in a high poverty area where most students are English Language Learners and close to 90% of them receive free lunches. Valley High School Educators decided to address student gaps in literacy by taking the holistic writing approach and integrating it into their Chicano studies class. The course is about the Chicano experience in relation to the following themes: history, identity, labor, gender and culture. While this course focuses on research and writing it takes a holistic method to teaching and learning. Students create murals, linoleum prints, and spoken word along with other forms of art. Each art piece is supported by research, a works cited page and thesis. Research skills are strengthened along with the student’s writing. In addition, students are required to construct a thesis surrounding their artwork, backed up with cited research. Instead of teaching writing and research separately, research lessons were taught throughout the year. Students were evaluated both on the artwork itself and the research that went into it. What is the impact of Holistic Writing integration? While initially it served eighty students, portions of the lessons bled over into history courses as the program moved forward. Over the three year project, they will reach 600 students and over 3,000 students will view their murals. Collaboration and teacher training has been a key factor in creating curriculum for this project. In the beginning of the project, it was necessary for the teachers to research the quality of papers at the college freshman level. Using what they learned, they developed a common rubric for the California High School Exit Examination (CAHSEE). Their program has proved very effective. The Chicano studies instructor accomplished this by collaborating with the English instructor. He brought a sense of structure and form, while the English teacher helped the students understand style. According to the report, the students participating in this method have a 79% CASHEE passing rate, as opposed to the school’s average of 59%. The students have used a multi-disiplinary approach to Chicano studies including creating pieces of art (sugar skulls, day of the dead altars, murals painted with both acrylic and aerosol paints). When this method was later applied to the World History class in the second year of implementation they found the same thing happened, 79% vs 59%. The results speak for themselves. If students are given the proper tools to excel, they will. The great thing about the holistic writing approach is that its reach far exceeds that of simple literary skills. It helps create a broader lens in which the student can view the world, their work, and ultimately themselves. This entry was posted in Literacy & Writing Skills, Uncategorized and tagged at-risk students, Chicana/o studies, Chicano, cultural studies, education, holistic writing, Latino. Among the many challenges facing us in education one of our most formidable foes is the comprehension gap, across all content areas, between students of low socioeconomic status and those of high socioeconomic status. E.D. Hirsch, The Case for Bringing Content Into The Language Arts Block and for a Knowledge Rich Curriculum Core for All Children American Educator, Spring 2006. While there are many factors that attribute to poor performance, one of the chief offenders is a lack of literacy skills. This is often noted at the college level when students are forced to take non-credit developmental education classes just to catch up to the basics. This both demoralizes the student as well as extending the amount of time they have to spend in, and thus pay for, college. By expanding literary sources, however, we expand the sphere of knowledge surrounding the content areas. Students can gain a broader context of how a given subject fits into the larger narrative of the real world. Chris Tovani in her text Do I Really Have to Teach Reading? Teachers need to move beyond textbooks to increase their literary skills so that they can better communicate their subject to students. So how do we get a teacher to step away from the science textbook and into some Sagan or Hawking? One of the ways we can work to address the knowledge gap is through the model of Peer Assistance and Review. In order to address inequity, our featured project at The School of the Future has done just that. With a Teacher Development Grant from McCarthey Dressman, The School of the Future helped improve the overall literacy of their teachers and subsequently their students. Teachers in high school met after school and collaborated to develop, create, and implement a curriculum that would enhance their students’ ability to read and write in the content areas (History, Math, Science and Technology) across the 11th and 12th grade. The group worked together to come up with a list of shared texts across content areas. While history and science have obvious literary sources outside the textbook, with a subject like math the teachers could study the history of math and biographies of mathematicians to give a wider scope to how the content area applies to the real world. Included was a training program for inexperienced or ineffective teachers to improve their literacy skills across their content area, specifically focusing on grades 11-12 to start. The difference between this program and previous initiatives aimed at teaching reading in the content areas was that previous efforts were top down administrative mandates that focused on ensuring uniformity in how reading, whereas the current effort was focused on expanding the teacher’s actual knowledge base. Past “one size fits all” approaches to teaching reading in the content areas failed to account for the fact that students read different types of texts in every content area. The unique aspect to this program is its need for a personal “buy-in” from the teachers. Not a monetary buy-in, but those teachers who want to get involved will need to be willing to pull up their sleeves and put a little more time on the table. What have the teachers accomplished with this project? During year one, five teachers (half the 11th/12th grade team) studied professional literature in their content areas to be able to implement a plan for teaching students to independently identify and analyze multiple non-fiction printed texts and non-print texts, at the student’s own instructional level, appropriate for the content of the class. Classroom visits and observations of each other in the form of Lesson Study, analysis of student growth, refinement of practice, creation of videos, continued throughout the year. In year two, participants in year one become “Anchor” teachers and shared best practices with the half of the team that was not previously involved (“Innovator Teachers”). For year three, the 11th/12th grade teacher team will mentor the 9th/10th grade team. Teachers can look to existing program models, such as the California Peer Assistance and Review program to get some idea on how they can best start their own. Those who have experienced it emphasize that PAR models should only be used as reference tools, not as fixed templates, which could hinder the development and implementation of plans tailored to meet individual schools and students needs and goals. What is Peer Assistance and Review? This entry was posted in Literacy & Writing Skills, Teacher Development and tagged achievement gap, curriculum, education, Educators, knowledge gap, literacy, Peer assistance and review (PAR), teacher development, United States.